OMG Luxe is introducing LUXE, limited. These are limited edition kits created exclusively for you by the Luxe Girls & Guys! 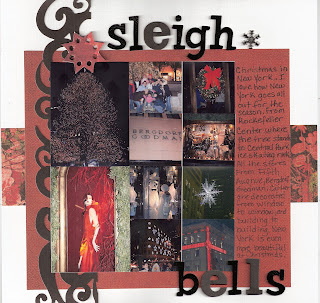 Visit their blog every day from Dec 3 -14 to see their one of a kind kits. So hurry and post your comments at their blog. Here's the link to their blog Living the Luxe Life. 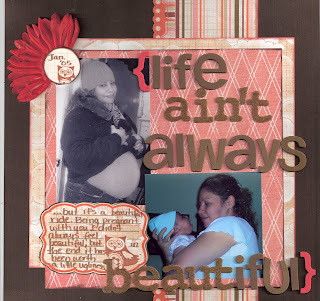 my journaling starts with the title " Life ain't always beautiful...but it's a beautiful ride. Being pregnant with you I didn't feel always beautiful, but in the end it has been worth a little ugliness." TFL Please check us out at Scrapping the Music and submit your layouts for a great prize. 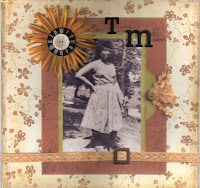 So many great things happening this week, first let me see that I made the DT at Treasured Scrapbooking. I am looking forward to working with the kits, which I love! At Savvynsassy we have our week long crop, so many challenges, classes and make n takes, so please join us. Crop will end on the 18 of Nov. Also at Savvynsassy they just announced their DT call, so if you love ribbon submit your layouts. Requirements are posted on the forum at Savvynsassy. Looking forward to seeing the submissions. At Simply Obsessed we are in the last day of the crop, come you still have time to create some projects as they are not due until tomorrow at 10pm eastern. So please join us!! This weeks song at Scrapping the Music Blog is titled "Photograph" by Nickleback love this song. I can't wait to see what you all create, please post your submissions at Scrapping the Music. November already, I'm looking forward to the holidays this year so much to be thankful for. I'm back in school, granted my midterm grade sucked, but I can't stress the past exams just have to look forward to the next few exams. Which means study, study, and study. Sometimes I wonder if I'm too old for this, but I know that I can do this. Determination!!!! Just want to make some announcements, Savvynsassy is having an online crop starting Nov. 9th and it will last for 10 days. Ladies there will be some awesome Ribbon giveaways. So if you LOVE ribbon like I do come and join us. 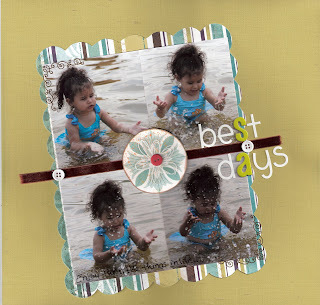 Finally here's my layout for Scrapping the Music, the song title this week is Best Days. 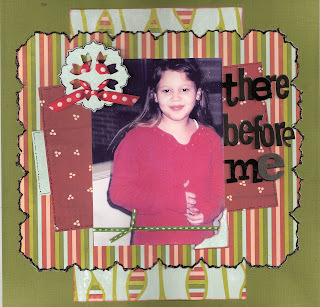 Have fun Creating and please remember to post your layout on the Scrapping the Music blog. I am terribly saddened to find out that Staci Compher, a guest DT member of TallyScrapper, has lost her husband. I cannot imagine what she and her family are going through right now. I am sincerely at a loss for words. Please join me in expressing our support for her and her family through this sad time. 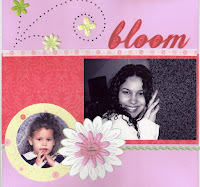 Please take a moment to visit Staci's Blog, and if your able please make a donation. for Scrapping the Music the song is You'll be in my Heart by Phil Collins. I knew right away who I was going to scrap, you see last year on Nov. 5th my brother Michael passed away. I have been dreading the one yr. anniversary of his death, but I knew that I had to honor his memory. So I created this layout in honor of him, because he will always be in my heart. 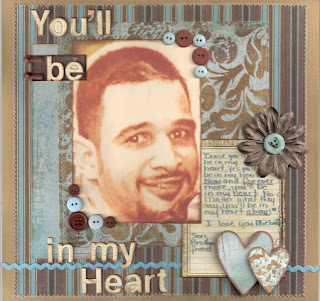 It was such a healing experience, yes I cried as I held his photo in my hand, as I created the layout, and when it was done I cried, but I know he's in a better place. here I am playing catch up. 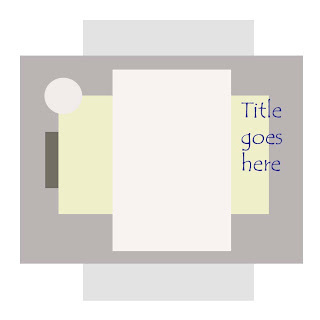 Just wanted to let you all know not forget to post your layouts to Scrapping the Music Blog, this week the song is My Wish by Rascal Flatts. I had never heard the song prior to creating my layout for the DT, but when I read the words I got chills. Love the song. 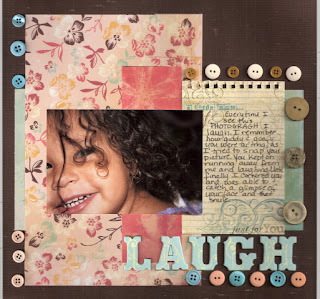 I can't wait to see your layouts posted, this weeks sponsor is Fresh Pages Co. .
Also Savvynsassy Ribbon kit is having their GDT contest for the month of November, so come on over for details here. 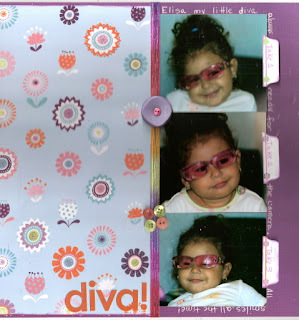 Some of my layouts this month created for Scrapping the Music, Savvynsassy, and Scrapncircle. I just cant believe it, how fast does the time goes. This is my favorite time of year, because it all starts with change. I love how the colors of the leaves on trees change, it's like a new beginning. It's like having a second chance to blossom all over, but in a different light. This time of year is when I stop and think what to I want to change about me, well of course it would be my weight, before Thanksgiving I would love to lose at least 10 pounds, is it possible yes, but I have to CHANGE my eating habits. I don't think eating 2 mini MR. Goodbar's is good at 9pm. Or my favorite coolatta coffee from Dunkin Dounuts (vanilla bean) will help either. UHM so what am I going to change, I think it will be my perspective on my life. I just need to be happy in the skin that I am in and change not because of the weight, but because of my health. You know I am not going to stay healthy eating junk food, so today I will try to just eat healthy. Can I live without my Coolatta yes, can I live with out my French Vanilla coffee (maybe), but I will try. I challenge you all to create a layout using the word Change in it!! Have fun, email me with your layout and I will enter you in a drawing for a RAK!!! Hi everyone, I am so excited to announce that I was chosen to be part of Simply Obsessed first Design Team . As I mentioned earlier this week, this is a new kit club so please come and check them out. They will have a gallery up and working soon! Come and check out their new forum. Looking forward to seeing you their. 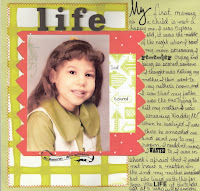 I am also excited to announce that I made it past round 1 and going on to round 2 at treasured scrapbooking. It's a contest that started last week titled the Treasure Hunt. 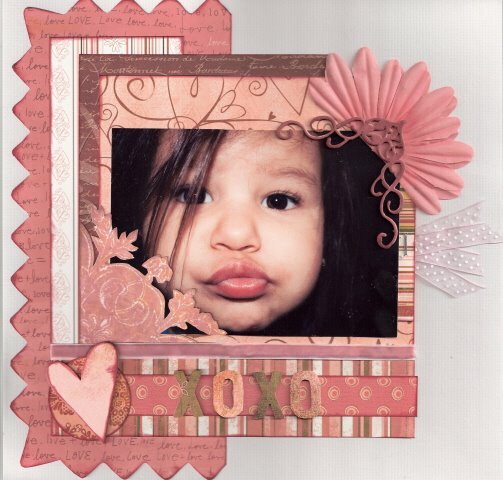 Here's my layout created for challenge #1! Well I got this card a few weeks ago from Sprint my PCS carrier and normally I throw these things out, but I kept looking at the card and thought. WOW this has so many possibilities. 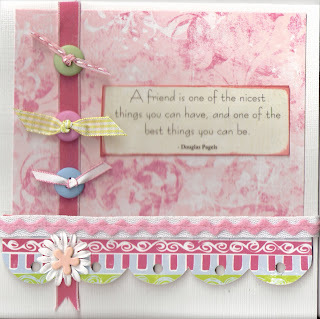 I can use this wonderful card as inspiration. How? 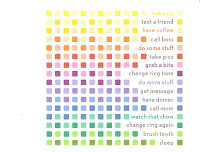 Well look at all the colors, the messages on the side can be journaling on the page, and lets not forget the squares so I challenge you all to create card or layout using this card as inspiration. Email me with your entries, and I will post here. Have fun. 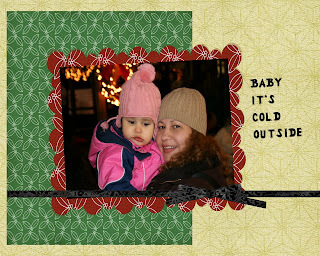 I can't believe it's been a month that I've updated my blog. So much has happened in the last month, both personal and craft wise. My personal family life has been such an emotional roller coaster that's what happens when you have kids. LOL. Also a family friend and a family member passed away both within the same week. 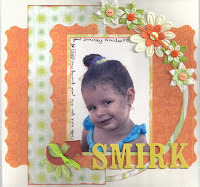 Okay so Rori at the Scrapbook Stand posted a challenge about our biggest fear last week, I really couldn't think of one. Well of course I fear losing my family, but I think that is everyones big fear not just mine. So on Sunday I was driving and I tell you memories of my biggest fear came flooding and I had to do everything possible to focus on the road and not let this feeling overwhelm me. My biggest fear as a child was driving over the Williamburg Bridge here in New York. I always felt that it was not a stable bridge, but it was always worse for me because my dad who was the only one who drove was an alcoholic. Yes and you can imagine he drove drunk, and one day we almost crashed on that bridge and my door open and I had to try to hold it closed while it was still moving. Seat belts were not a requirement then. So just picture it me at the age of about 10 or 11 and struggling to hold closed this door while the car is moving on a bridge on the outside lane. The worst part was that after he stopped the car and closed the door, he just slaps me and tells me it was my fault. Yes he was also an abusive man. Unfortunately that was not the first time we almost had a car accident or almost died. That same summer we went to the mountains to a lake there, and everyone was drinking and all I could think of was WHY? As we were leaving the lake we had to drive through one of those small roads with just trees and trees all around, but the trees were deep as if we were on a cliff driving and then it happened he started arguing with my mom, he then swirved the car when it happened our car was halfway off this road(cliff) luckily we were traveling with about ten cars in tow everyone jumped out of their cars and had to lean on the trunk so that me and my sisters can get out. They were able to move the car back on the road, but I thought this is it were dead. Now back to this past Sunday, I was driving on the New Jersey turnpike and my exit happened to be a bridge that reminded me somewhat of the Williamsburg bridge when all the memories came flooding I was like OMG please dear God help me to steer this car in the right direction, don't let me lose focus on the road I have my family in the car. Well of course I managed, but at the first rest stop I woke up my DH and told him he had to drive. My hands were trembling so bad and my heart was pounding to fast. The memory was as if it was yesterday, I just wanted to scream. I thank God everyday for my life as it is now. I don't live in an abusive home, or an alcoholic home. Is there something wrong with drinking a glass of wine, no but when you drink more than that just one glass of wine or alcohol and then drive YES there is. My biggest fears are a number of things now looking back, one is that I don't want to be like my father, and always hope I'm doing the best for my kids. I adore them. Two is that I set a good example for my kids so that they don't turn to drugs or alcohol, would I love them any less no, but I want them to know that they can achieve anything they want to. Three that I would never be a fool and knowingly drive under the influence of even one drink because I think I can, and four that I never lose control in a car while driving over a bridge. The best things about knowing my fears now is that I can do everything possible to overcome them. Okay so this is the first time I create a sketch with Photoshop elements, thanks to a friend who helped me through. I owe her big time. So my challenge is to create a layout using this sketch. I can't wait to see what you create. 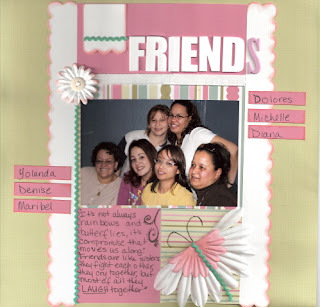 Please email your layouts to Edenroses66@yahoo.com. RAK giveaway. 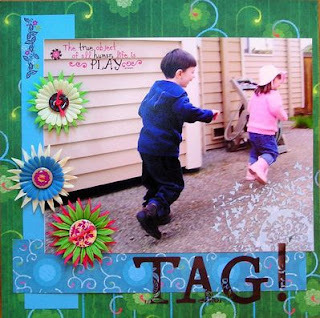 Tag Layout created by Jennie @2Jills. 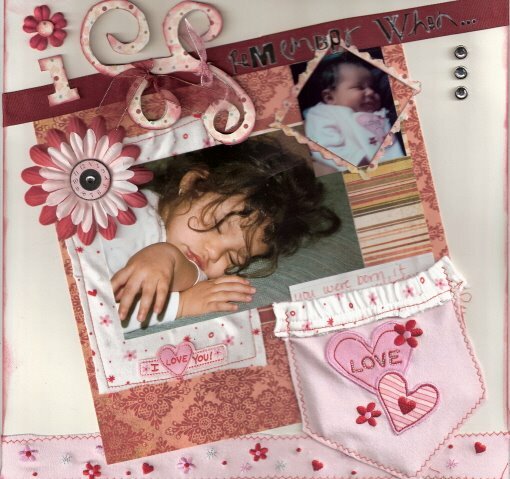 I had so much fun creating DT projects for Timeless Inspirations using the Piggy Tales Gretel collection, it went so well with my GDT ribbons I received from Savvynsassy. 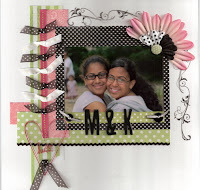 Here are 2 layouts I created, friends layout was created from a sketch given to the DT at Timeless Inspirations. 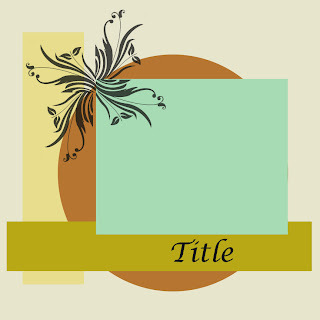 My challenge this week is to create a layout with at least 2 circles. I hope you have as much fun as I did. Sometimes we need a spash of color. I am so used to having a routine, that when things don't quite turn out that way I feel as though I'm lost. So much has happened in the last few days, that I felt as though I was lost. KWIM. I realized that I spent way too much time on the computer. It has been my daily routine for the last year, but on Saturday I decided you know what I can still check my regular boards, post comments and then get off my rear and take care of other things. I thought OH NO will I be able to do this, YES I did. I feel so good about it, will I be out of the loop, will I miss something online, maybe but it will not take over my life. Summer is fast approaching and I want to be able get up and excersice, go out with my kids and just have FUN. So when you think that life is just black and white, add a little color. 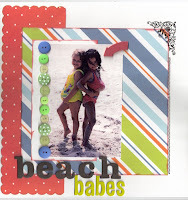 So my challenge for you this week is to create a layout, using the colors Black and White and a splash of color. 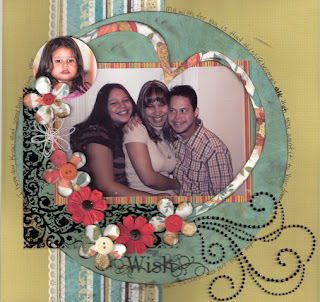 Email your layouts to Edenroses66@yahoo.com. 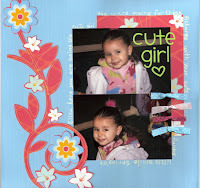 I will post layouts as I receive them and annouce a winner May 21, 2007. 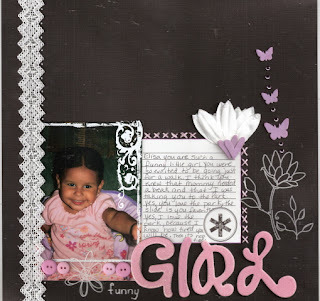 Above is my example layout, I used a sketch provided by Rhea on her blog ( http://sassys-spot.blogspot.com/ ). have fun can't wait to see what you come up with! I've taking the plunge and have created a blog. Boy was I behind in the times, it seems that every scrapper I meet has a blog spot and when they ask me for mine I draw a blank. Didn't really see the point in blogging then, but after viewing so many blogs I figured hey why not? I can do this, so here it is my blog. What do I do now, don't know but, guess what I will learn from the help of my friend who is addicted to Blogs. Now let me tell you a little about me. 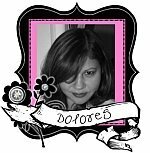 My name is Dolores, and I reside in the town of New York Yankess. I am a wife, a mother of 4 beautiful kids, I am a sister, a daughter, and last but not least I am a scrapper. I believe that God paves the way for all I do in life, He is the one I can count on, when all else fails. 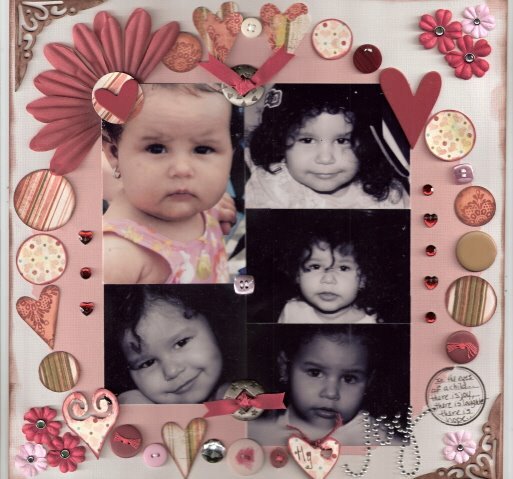 My family are the joy of my life, and for me it is important to preserve the memories in my daily life. The Good, the bad and the ugly. 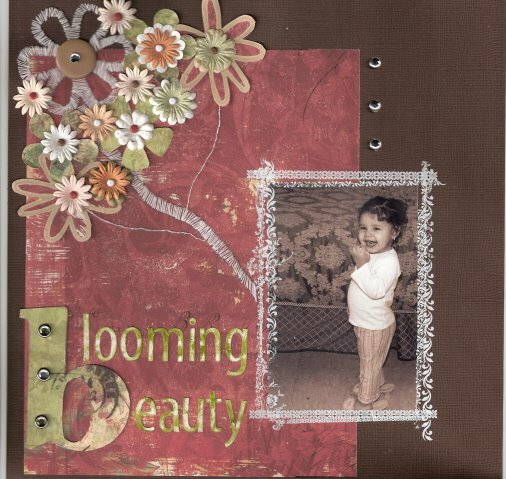 My favorite embellishments are buttons, flowers and ribbons. My favorite techniques are sewing and inking at the moment.